Designed to make a statement, this sleek timepiece by iconic brand Longines is the ultimate accessory for the modern man. Overtly masculine and unflinchingly professional, this stainless steel watch features a smart deep black dial, contrasting silver indices, chronograph and tachymeter. 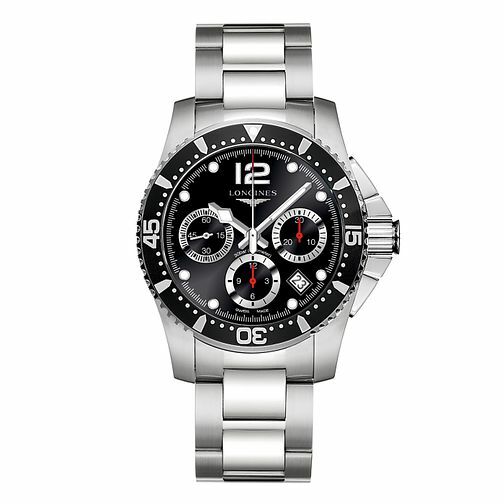 Longines HydroConquest Men's Black Chronograph Watch is rated 5.0 out of 5 by 1. Rated 5 out of 5 by Anonymous from Great Swiss Made Watch... The watch looks outstanding. The chronograph feature add extra appeal to the watch. Timeless classic.